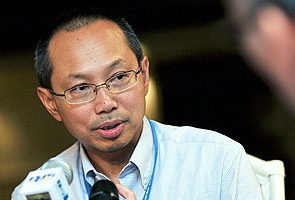 JOHOR BAHRU: Datuk Seri Abdul Wahid Omar, recently appointed as Minister in the Prime Minister's Department, will resign as President and Chief Executive Officer of Malayan Banking (Maybank) Bhd on June 4. He will take his oath of office as Senator on June 5 in order to assume his new portfolio. "Let me complete my duties at Maybank which will release its first quarter financial results on May 23. "For now, I want to focus on Maybank and will make a statement on my new portfolio after I take public office," he told reporters after officiating the Menara Maybank office model in Legoland, Nusajaya, here today. After helming three corporate giants namely UEM Builders Bhd, Telekom Malaysia Bhd and Maybank, Abdul Wahid described his new responsibility as very challenging. "As a minister, this is a public office with a mammoth responsibility where the stakeholders are not only the shareholders and customers but also the citizens of Malaysia. So, this is a great responsibility," he said.